At the beginning of March the European Commission published a White Paper (WP) on The Future of Europe at 27 (i.e. the current EU-28 minus the UK). Presented in the context of broader celebrations of the 60th anniversary of the Rome Treaties, the WP is in part a celebration of the EU’s achievements to date, particularly in terms of its contribution to peace and relative stability and security in Europe. In an attempt to unite and galvanise the 27 it also contains within it a veiled – and in places not so veiled – critique of Brexit Britain and those who would potentially follow its course. Note, for instance, Britain’s position in the below WP graphic: heading into unknown institutional territory if the ‘hard’ Brexit currently in favour with some ultimately transpires. At the same time the WP offers an implicit acknowledgement of the fact that Brexit Britain is not a complete outlier; that in some senses the UK’s referendum debate and outcome reflects broader EU-wide trends even as it was an extreme instance of them. It notes that, ‘a third of citizens trust the EU today, when about half of Europeans did so ten years ago.’ Following from this it implicitly recognises that the mantra of ‘ever closer union’ – famously opposed by David Cameron in the context of his re-negotiation with the EU – is not popular with many citizens or their governments well beyond Britain. The WP acknowledges then that alternatives to a straightforward integrative path have to be at least considered and it lays out five scenarios as ‘glimpses into the potential state of the Union by 2025’. These are presented as the basis for deeper and more systematic reflection pieces to be published between now and the end of 2017 on, inter alia, the EU’s social dimension, harnessing globalisation and economic and monetary union (EMU). Scenario (1), ‘carrying on’, broadly involves maintaining the status quo of piecemeal reform and crisis management, though it is presented as being about ‘upgrading’ as well as ‘implementing’ the current reform agenda, particularly in line with the proposals of Juncker’s New Start for Europe. Scenario (2), ‘nothing but the single market’, effectively means sustained market integration while backtracking on aspects considered to be more ‘political’. As Iain Begg has pointed out, this has (perhaps ironically) found its way on to the agenda too late for many mainstream Brexiteers, for whom it would have constituted a desirable option. That said, while the Commission states its neutrality vis-a-vis all of the scenarios presented, it is more explicitly dismissive of this option than any other. It emphasises the possibility of a socially and environmentally deleterious regulatory ‘race to the bottom’ in a context of substantial policy repatriation. In short, ‘spillback’ creates as many issues as it solves because ostensibly political and economic areas are more interdependent than advocates of this scenario acknowledge (and as the UK is likely to discover in the years ahead). Scenario (3), ‘those who want more do more’, refers to what in the academic literature is variously described as the possibility of differentiated, multi-speed integration or the establishment of a ‘variable geometry’. 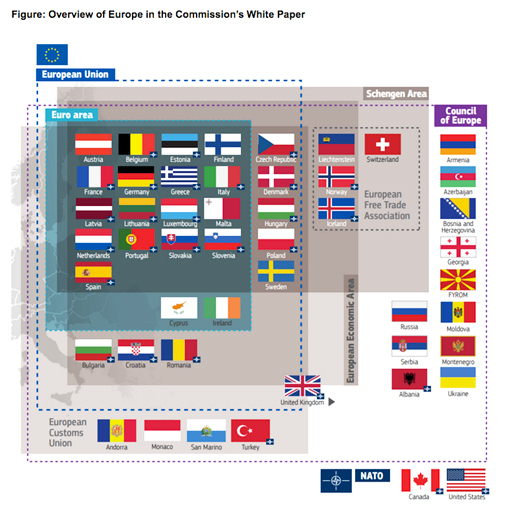 In some senses a variable geometry is what has de facto emerged (as the above graphic illustrates), with different countries participating in different European projects within and outwith the EU. The problem with this approach has been the risk that it contributes to the disintegration of the EU because states pursue integrative schemes outside of its framework (think, for instance, of the so-called Fiscal Compact of 2013). As a consequence, projects that started off outside of the EU framework have been drawn into it (e.g. Schengen) and the possibility for a group of states to pursue ‘enhanced cooperation’ within the framework of EU law and institutions has been catered for in the treaties since Amsterdam and was reinforced with the Lisbon Treaty (though has been little used). Whatever the mechanisms, the WP’s short reflection on this envisages the ‘core’ of those states likely to pursue deeper integration as the eurozone and suggests that tax and social policy are policy areas where this could occur. Scenario (4), ‘doing less more efficiently’, refers to deeper integration in some areas but disintegration in others. It would be aimed at developing a clearer and more understandable division of member state and EU responsibilities, which might increase the legitimacy of the EU for its citizens. In particular, regional development, employment and social policy, state aid control and the environment are cited as areas where the EU might do less in this scenario. At the same time, in core economic and security areas implementation would be beefed-up. The WP makes clear that any one of these scenarios will transpire not as a result of some uncontrollable structural logic, but ‘depending on the choices that we make’ where the ‘we’ presumably refers to the 27 member states that will ultimately guide any future trajectory. But the unity of that ‘we’ is highly questionable. Already political divisions are emerging between a group of the EU-27’s largest states – France, Germany, Spain and Italy – and the ‘Visegrad Group’ (or V4 – Poland, Hungary Slovakia and Czech Republic). While the former immediately expressed a preference for scenario (3), multi-speed EU, the latter are firmly opposed to this option (though not clearly in favour of any other). Some have speculated that talk of a multi-speed Europe may in part reflect a political gamble by Merkel to push recalcitrant governments into line and avoid united opposition to EU/German preferences of the kind we have seen from the V4 on the refugee crisis. Given the tricky domestic politics in certain of those countries it is certainly a risky gamble. Moreover, the unity on both sides of this key fault-line is far from assured. Germany and the other big three are not entirely united and will be less so if France elects Le Pen or if Italy’s precarious political and/or financial system sees further upheaval. And the V4 are, despite some recent agreement, also divided, with the Czech Republic and Slovakia (the only V4 euro state) certainly more reluctant to confront Germany. It will be interesting to see whether the illusion of unity is in place when the member states meet in Rome in late March for the aforementioned 60th anniversary celebrations. Formidable obstacles abound then. But the difficulties arguably run even deeper than these disputes suggest. Part two of this blog will argue that even if these inter-state divisions were surmountable, from a political economy perspective the Commission’s scenarios would still fall well short in terms of addressing the EU’s multiple crises.